Start with two equal lines in the middle of the ice, each line just outside the hash marks as shown in the diagram. In this variation the coach starts each group with a pass to one of the first players in each line. The first two players go down the ice passing and receiving the puck IN STRIDE. When the players receive the puck they stick handle one time then make a good sweep pass. 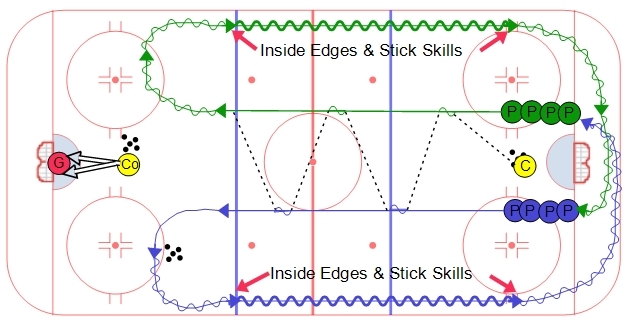 The player from Line #1 makes sure they have the puck at the far blue line and they turn to the outside and come back down the ice in the outside lane. The player in line #2 makes sure that the other player has the puck at the far blue line and they turn towards the outside while picking up a puck from the the pile of pucks at the top of the circle as shown. This player also comes back down the ice in the outside lane. Both players work on their hands back down the length of the ice. You can set up specific skills such as around the world or "quick hands" depending on what you want them to work on. When the players come back to the lines then they go to the opposite line. The coach dictates how often players go by starting each group with a pass. The goal is to get have the players almost going on a coninuous basis with very little waiting in line. At the other end another coach can warm up the goalies.